Yamdrok Lake (also known as Yamdrok Yumtso or Yamzho Yumco; Tibetan: ཡར་འབྲོག་གཡུ་མཚོ་, Wylie: yar-'drog. G’yu-mtsho, ZYPY: Yamzhog Yumco; Chinese: 羊卓雍錯; pinyin: Yángzhuō Yōngcuò) is a freshwater lake in Tibet, it is one of the three largest sacred lakes in Tibet. It is over 72 km (45 mi) long. The lake is surrounded by many snow-capped mountains and is fed by numerous small streams. The lake has an outlet stream at its far western end and means turquoise in English due to its color. The lake (638 km² in area, 30 meters average depth and 60 meters at its deepest) is fan-shaped, spreading to the south but narrowing up to the north. The mountainous lakeshore is highly crenellated, with numerous bays and inlets. Lake Yamdrok freezes in winter. Yamdrok Lake has a cold steppe climate (BSk) with long, cold, very dry winters and short, cool, wet summers. It is also bordering on an alpine tundra climate (ET) and on a subarctic climate (Dwc). The differences between day and night are great. There are shoals of fish living in Yamdrok Lake, which are commercially exploited by local population. From April to October, fish caught from this lake are sold at markets in Lhasa, Tibet's capital. Additionally, the lake's islands serve as rich pasture land to local herdsmen. ^ "Guide to Tibet - Things to do, Place to visit, Practicalities". 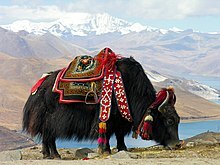 ^ "Guide to Tibet - Things to do, Places to visit and Practicalities". ^ a b c Petra Seibert and Lorne Stockman. "The Yamdrok Tso Hydropower Plant in Tibet: A Multi-facetted and Highly Controversial Project". Archived from the original on 2007-08-05. Retrieved 2007-06-29. This page was last edited on 11 May 2018, at 03:32 (UTC).